Do you have a small living room in your tiny home, small apartment or condo? Feeling cramped and wish you could make it feel bigger? Learn 7 Ways To Make A Small Living Room Feel Larger Instantly! Expand your living room visually and create a feeling of spaciousness with these amazing design tips. 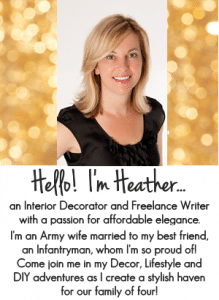 Using mirrors, decor and lighting in strategic ways you can! 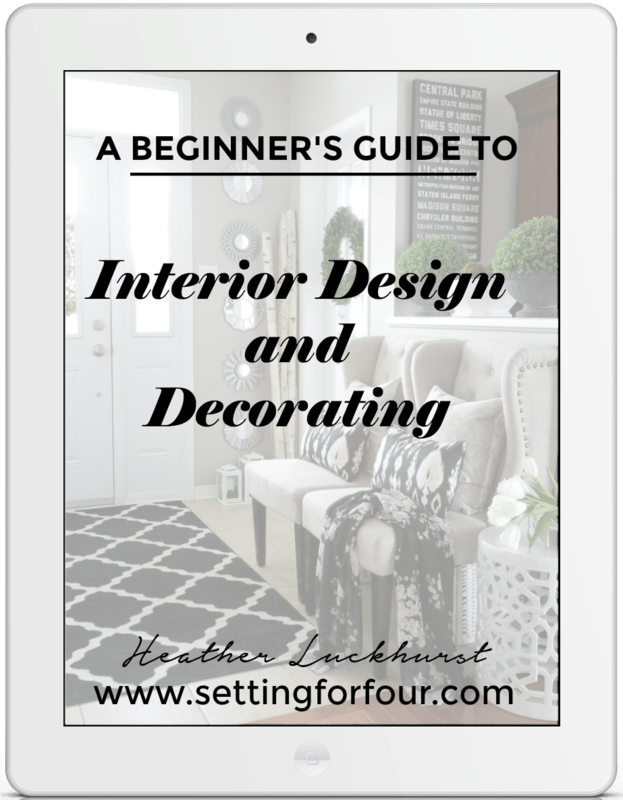 Read my decorating tricks on how to banish that cave-like feeling and get the brightness and openness you crave! Use the height of your walls in your small living room to your benefit! Hang your TV on a wall off the floor and above a TV stand, hang a gallery wall so that some pieces are closer to the top of the ceiling, hang curtain rods at the top of the wall and use shelving units that go as high as possible to keep everything off the ground and draw the eye up. Some shelving units can even be hung off the floor! 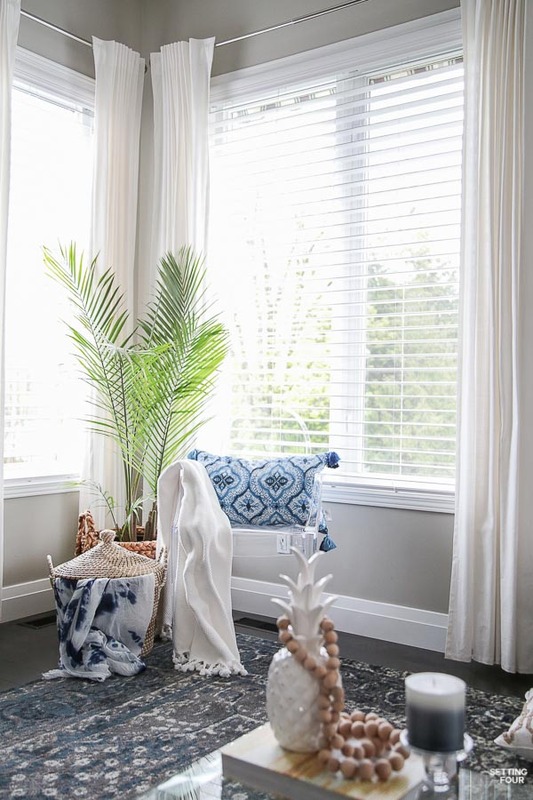 Adding a fresh coat of a neutral paint color such as white, greige or gray with cool undertones or using a cool color on the color wheel such as blue, purple or green will instantly brighten up your living room. Cool colors recede (and make the walls recede so the living room looks larger) while warm colors advance. Simply White is a great wall color that isn’t stark white but will make your room feel bigger. My go-to favorite gray wall color is amazing at making our living room feel bigger than it is! Use a color palette in your living room that’s unified throughout the room. Using colors in your furniture, flooring, wall art and decor accents that don’t clash and are a shade lighter or darker as one another will make your living room feel bigger. 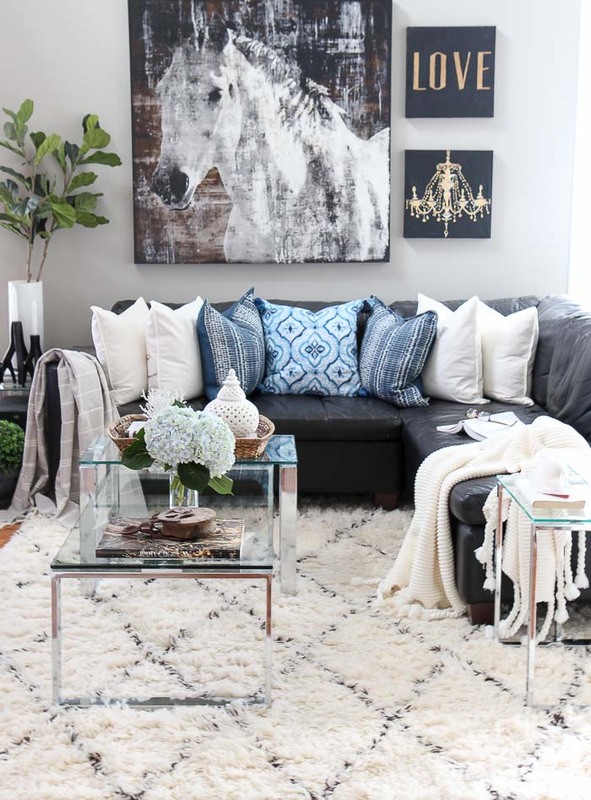 This living room uses a unified color palette of white, beige, gray and blue in the sofa fabric, area rug, pillows, wall color, wood tones and decor. 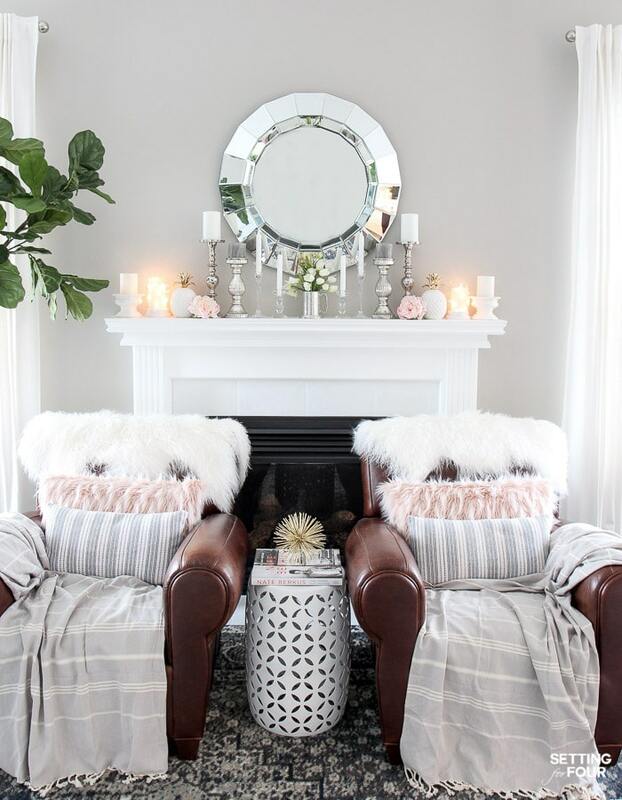 Shop these pieces that will make your small room feel larger! Click on the images below to see more about each item. Scroll using the arrows to see them all! 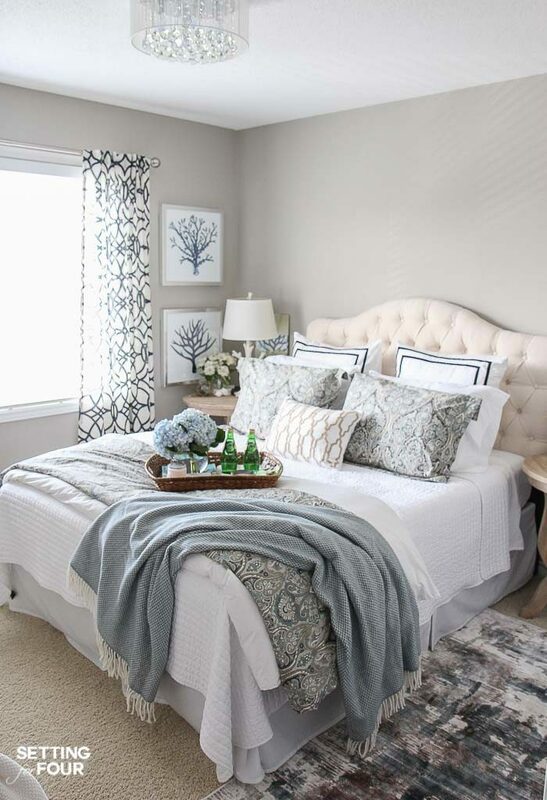 Our guest bedroom uses a similar unified color palette of white, gray, beige and blue. Let as much light in as possible by covering very little of the window. Hang curtains wide so that most of the material covers the wall on each side and just barely covers the window frames. Buy curtains that are light colored and light weight such as cotton and linen. My living room curtains are cotton and they really make our living room bright and spacious looking! 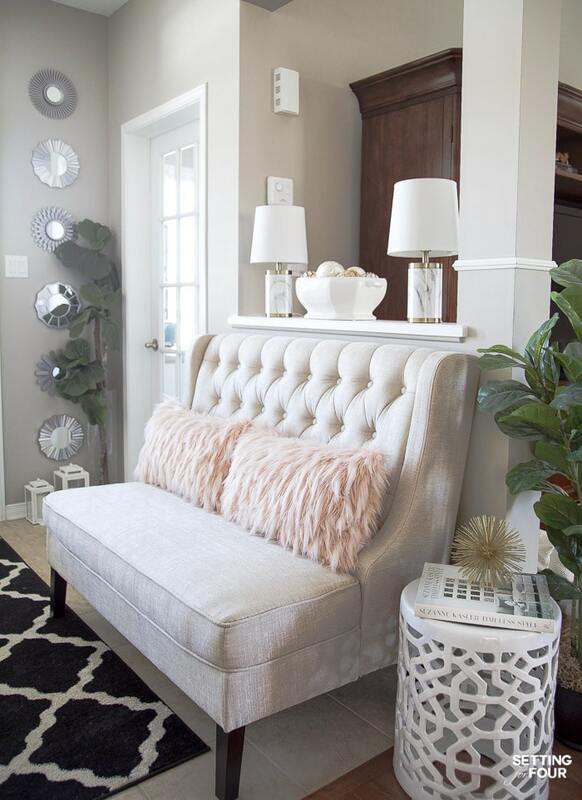 Use an apartment sized sofa, loveseat or settee like I did in our entryway to add seating in a small room! 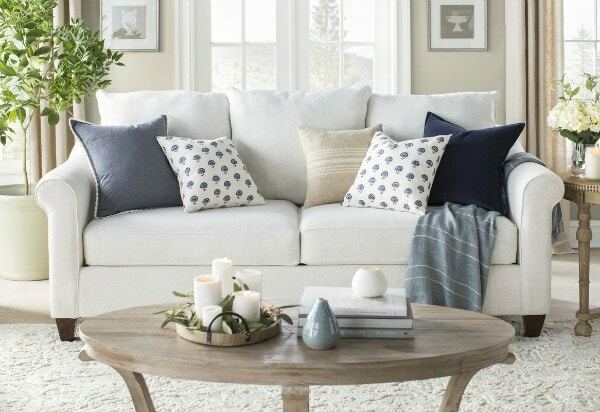 Buying a sofa that is smaller than normal size will give you the seating you need but won’t crowd the room. Adding a rug to a room changes it completely visually and makes it look bigger! Make sure the front legs of your sofa and chairs are on the rug. Neutral color rugs such as ivory, beige, gray and greige will make your living room appear bigger. Or try a rug in cool blues. 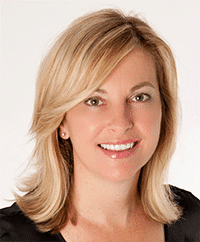 Remember the color rule that cool colors recede and warm colors advance! There are several design tricks you can use with the right coffee table that will make your living room feel more spacious! Choose a glass coffee table that won’t take up a lot of space visually. 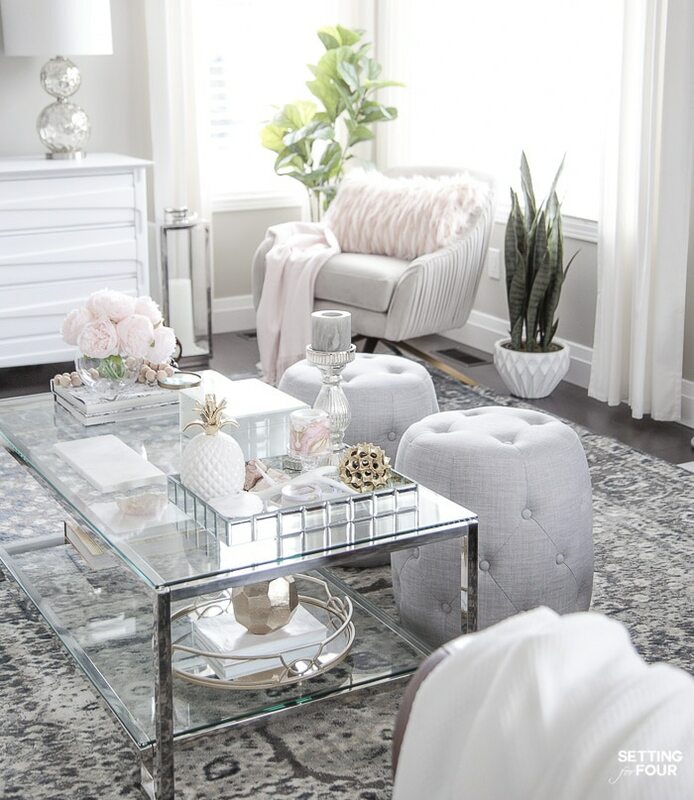 I love our living room tiered coffee table because you can see the rug though it and it virtually disappears in the room making it look larger! If you love wood coffee tables skip the darker wood stains like espresso brown and black and instead choose lighter wood tones such as driftwood, blond wood colors or bleached woods. If you love upholstered coffee tables – choose one that doesn’t have a busy pattern and has a color that blends into your area rug. Or skip the coffee table entirely and use one small ottoman that you can put a tray on. If you have zero room for a table add a narrow console table behind the sofa to display decor on, add a decorative box for your media remotes and store a few books! 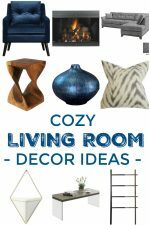 I hope you enjoyed these 7 Ways To Make A Small Living Room Feel Larger Instantly! Do you have any other tips?